In these troubled times, people seek answers to the great questions of life in many places–in nature, in traditional religions and philosophies, even in the vast reaches of outer space with the hope that a superior alien race will come to enlighten us. 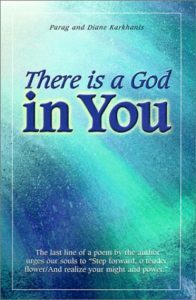 There is a God in You opens up another, limitless vista for enlightenment: one’s own soul. Parag writes that in India, the word Namaste is a common way for people to greet each other. In English, it translates, “I salute the God in you.” In the words of the authors, “God is always with you, because God is everywhere.” Through the Steps of Evolvement, Parag and Diane move from Restlessness, the desire to find answers; to Recognition of the energy which vibrates throughout the Universe; seeing Order in the randomness of the world; Taking Pleasure in Life, and finally, Creating Consciously to lead a rich, fulfilling spiritual existence.